Working in collaboration with Dr. Michael Kjaer and his research group at the Institute of Sports Medicine and Centre of Healthy Aging at the University of Copenhagen in Denmark, the UC Berkeley researchers compared samples of muscle tissue from nearly 30 healthy men who participated in an exercise physiology study. The young subjects ranged from age 21 to 24 and averaged 22.6 years of age, while the old study participants averaged 71.3 years, with a span of 68 to 74 years of age. Recently, researchers in England discovered that simply rinsing your mouth with a sports drink may fight fatigue. In the experiment which was published online in February in the Journal of Physiology, eight well-trained cyclists completed a strenuous, all-out time trial on stationary bicycles in a lab. The riders were hooked up to machines that measured their heart rate and power output. Throughout the ride, the cyclists swished various liquids in their mouths but did not swallow. Some of the drinks contained carbohydrates, the primary fuel used during exercise. The other drinks were just flavored, sugar-free water. I wonder how soon they'll start to market carbhydrate laden mouth washes to the low-carb set? Interesting stuff! Tara Parker-Pope writes about a small study on sleep and fitness for the NY Times. Most people training for a race or sport focus on adding more miles, workouts or weight training to improve their fitness. But new research suggests that simply getting more sleep can improve athletic performance. The small study included five members of the Stanford women’s tennis team. For two to three weeks, the athletes maintained their regular schedules, sleeping and working out as usual. They took part in sprinting and hitting drills to measure their performance. Then the players were told to extend their sleep to 10 hours a night for five to six weeks. After increasing sleep, the athletes performed better on all the drills. Sprinting drill times dropped on average to 17.56 seconds from 19.12 seconds. Hitting accuracy, measured by valid serves, improved to 15.61 serves, up from 12.6 serves, and a hitting depth drill improved to 15.45 hits, up from 10.85 hits. Nice to see these ideas hitting the mainstream press. From the abstract of "Oral administration of vitamin C decreases muscle mitochondrial biogenesis and hampers training-induced adaptations in endurance performance"
Background: Exercise practitioners often take vitamin C supplements because intense muscular contractile activity can result in oxidative stress, as indicated by altered muscle and blood glutathione concentrations and increases in protein, DNA, and lipid peroxidation. There is, however, considerable debate regarding the beneficial health effects of vitamin C supplementation. Objective: This study was designed to study the effect of vitamin C on training efficiency in rats and in humans. Design: The human study was double-blind and randomized. Fourteen men (27–36 y old) were trained for 8 wk. Five of the men were supplemented daily with an oral dose of 1 g vitamin C. In the animal study, 24 male Wistar rats were exercised under 2 different protocols for 3 and 6 wk. Twelve of the rats were treated with a daily dose of vitamin C (0.24 mg/cm2 body surface area). Results: The administration of vitamin C significantly (P = 0.014) hampered endurance capacity. The adverse effects of vitamin C may result from its capacity to reduce the exercise-induced expression of key transcription factors involved in mitochondrial biogenesis. These factors are peroxisome proliferator–activated receptor co-activator 1, nuclear respiratory factor 1, and mitochondrial transcription factor A. Vitamin C also prevented the exercise-induced expression of cytochrome C (a marker of mitochondrial content) and of the antioxidant enzymes superoxide dismutase and glutathione peroxidase. Conclusion: Vitamin C supplementation decreases training efficiency because it prevents some cellular adaptations to exercise. The maximal rate of oxygen consumption ( O2max) increased significantly after 8 wk of training in both the nonsupplemented men (22.0% increase) and the men supplemented with vitamin C (10.8% increase). In 1999, Nielsen et al (29) found no effect of antioxidant supplementation on O2max in triathletes. We found a very similar result in our animal study—ie, a significant increase in O2max after 6 wk of training in both the nonsupplemented (17.0% increase) and the vitamin C–supplemented (4.7% increase) groups. Endurance capacity is dependent mainly on the mitochondrial content of skeletal muscle (muscle oxidative capacity), not on the cardiovascular factors previously mentioned (20). For obvious ethical reasons, we could not perform an endurance laboratory test in our volunteers. Thus, to determine the effect of the antioxidant administration and exercise in the mitochondrial muscle content, we performed another series of experiments in rats. We divided our animals into 2 training groups: endurance-trained for 3 wk and endurance-trained for 6 wk. Six weeks is approximately the period required to achieve a new steady state mitochondrial content in response to endurance training (15), although changes in mitochondrial protein and mRNA content can be apparent at much earlier time points (22). In our study, endurance-trained rats showed a clear increase (186.7%) in their endurance capacity. However, the administration of vitamin C dramatically decreased this adaptation to only 26.5%. This finding is in keeping with a previous study in which it was shown, using endurance-trained rats, that O2max increased only 14% despite a 100% increase in muscle oxidative capacity (21). One of the main conclusions from that study was that the mitochondrial content of muscle is a major determinant of endurance capacity, whereas the maximal aerobic workload capacity appears to be regulated by O2max (21). 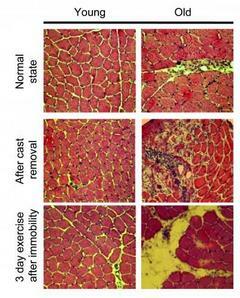 We offer a molecular explanation for this result (ie, that vitamin C decreases exercise-induced mitochondrial biogenesis and the antioxidant capacity in skeletal muscle). We have found that exercise training up-regulates the following mitochondriogenic pathway: PGC-1 NRF-1 mTFA cytochrome C. All of these adaptations are prevented by vitamin C administration. When supplementing with vitamin C, there is the possibility that it may act as a prooxidant in vivo. These prooxidative reactions of vitamin C readily occur in vitro, and it has been shown that they also may have relevance in vivo (30). A high intake of iron along with ascorbic acid could increase in vivo lipid peroxidation of LDL and therefore could increase the risk of atherosclerosis (31). However, another study showed that, in iron-overloaded plasma, ascorbic acid acts as an antioxidant and prevents oxidative damage to lipids in vivo (32). In the present study, we measured different variables of oxidative stress, eg, blood glutathione oxidation and plasma malondialdehyde, in rats and men (data not shown); we did not find an indication of an in vivo prooxidant effect of vitamin C in any of the experimental groups. It is important to consider that free radicals are not always damaging to cells; in many cases, they serve as signals to adapt muscle cells to exercise via modulation of gene expression (9, 33). We have found that training causes an increase in 2 major antioxidant enzymes (Mn-SOD and GPx) in skeletal muscle. We were surprised to see that vitamin C prevents these beneficial effects of training. On the basis of the paradigm that enzymatic antioxidant systems such as Mn-SOD and GPx provide a first-line defense against ROS, it is expected that exercise may induce these protective mechanisms. Moderate exercise increases life span and decreases disability in rats (12) and humans (15). We report here that exercise training causes an increase in the expression of antioxidant enzymes, which is prevented by the administration of vitamin C.
A major conclusion that can be drawn from our experiments is that exercise itself is an antioxidant, because training increases the expression of 2 antioxidant enzymes related with longevity—namely, SOD and GPx. We provide evidence that the continuous presence of small stimuli, such as low concentrations of ROS, in fact induces the expression of antioxidant enzymes as a defense mechanism. Low concentrations of radicals may be considered to be beneficial, because they act as signals to enhance defenses, rather than being deleterious, as they can be when they are at higher concentrations. The second major conclusion that can be drawn from our experiments is that supplementation with vitamin C lowers training efficiency. Endurance capacity is directly related to the mitochondrial content. This variable is seriously hampered by antioxidant supplementation, whereas O2max, which is dependent also on the cardiovascular system adaptations, is not significantly affected. This information is helpful for nutritionists who must prepare diets for athletes whose performance is dependent on their endurance capacity. It should be taken into account that some of the world's best marathon runners exhibit rather modest measures of O2max (34). Antioxidant supplementation is very popular among athletes, but data showing any beneficial effects on muscle function of this type of widespread practice are elusive. In fact, several reports have shown deleterious effects of antioxidant treatment. As early as 1971, it was shown that vitamin E supplementation (400 IU/d for 6 wk) caused unfavorable effects on endurance performance (35). In 1996 and 1997, a Scandinavian journal published 2 reports showing the deleterious effects of ubiquinone-10 supplementation on the performance of humans after a high-intensity training program (36, 37). In 2001, Coombes et al (38) reported that, in the muscles of unfatigued rats, supplementation with vitamin E and -lipoic acid depressed muscle tetanic force at low stimulation frequencies. One year later, it was shown that supplementation of racing greyhounds with 1 g vitamin C/d for 4 wk significantly slowed their speed (39). Taking into account that a high fitness level is associated with a lower risk of premature death from any cause, the effect of vitamin C administration on endurance capacity has important implication for nutritionists, physicians, and exercise trainers and practitioners. Thus, the common practice of taking vitamin C supplements during training (for both health-related and performance-related physical fitness) should be seriously questioned. If this holds up it should cause many of us to rethink supplementation (or at least certain supplements). Any counter science out there?